Reuters) – Notre-Dame Cathedral went up in flames on Monday in a roaring blaze that devastated the Parisian landmark, one of France’s most visited places. Fire-fighters cleared the area around the cathedral, which marks the very centre of Paris. 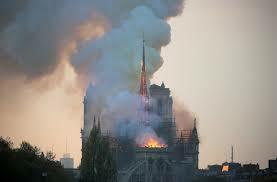 “A terrible fire is under way at Notre-Dame Cathedral in Paris,” Mayor Anne Hidalgo said on Twitter. The cathedral, which dates back to the 12th century, features in Victor Hugo’s classic novel “The Hunchback of Notre-Dame”. It attracts millions of tourists every year.